The Administration buildings are necessary for us to do our work, but they are the least expensive buildings that we own. 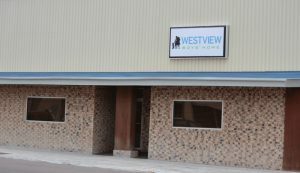 Westview has purchased two storefronts in downtown Hollis which serve as our Commissary and Main office; other necessary maintenance buildings are on the old Westview school site. 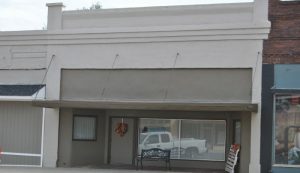 Westview’s offices are located at 120 West Broadway (Highway 62 through town) in downtown Hollis. This facility houses campus administrative personnel, the mail room, counseling rooms, training facilities, and meeting rooms. In 1979 this building was converted from the former Hill’s Department Store into offices. In 1981, an old theater located across the street from Westview’s offices came up on the market. The administration, realizing our need for more space to warehouse groceries and clothing, purchased this building. On the main floor of this structure, groceries are stored and distributed. When the household pantry stock gets low, caregivers come to the commissary and gather the groceries they need. This commissary has a walk-in cooler and freezer. It also has lots of shelving on which food donated to Westview is sorted and stored. The second floor of this facility is used as a clothing room. Donated clothing is sorted, hung on racks or folded and placed on shelves. Residents can then come to this room with houseparents and choose clothing that they like. For some young men, this is the first time they have been able to choose their own clothing. Through having this opportunity to make choices for themselves, they learn how to make wise decisions.